I was an elementary school student when I met the coolest teacher I have ever known. His name was Mr. E (the resulting sound that makes in this context is perfect). He was always smiling, laughing and joking with his students. He made learning fun and had a charismatic way of dealing with both teachers and kids alike. As an adult, I rarely see him nowadays, but on the occasions that I do, I always make sure to strike up a conversation, letting him know how grateful I am for the positive atmosphere he always carried with him. Mr. E., the modest man that he is, always downplays his role those many years ago. Denpa Kyoushi is an anime featuring a similarly universally liked teacher. But where Mr. E always deserves to be remembered, this anime should be placed in the trash where it deserves to belong. Denpa Kyoushi does everything in its power to steer itself wrong. While the “otaku” motif persists throughout the season, the praise stops there, the anime constantly losing focus, shifting plot lines, and forgetting ideas, ultimately destroying any semblance of worth the show might have held. 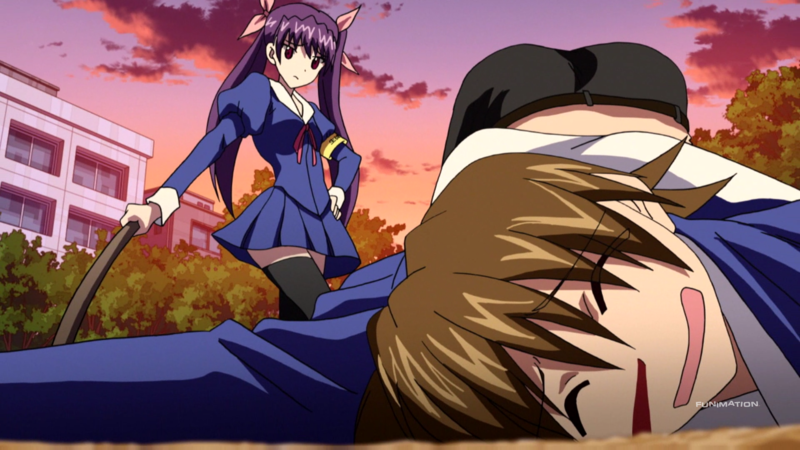 At its core, Denpa Kyoushi is an anime centered on a singular notion: “otaku”. Besides the title of the show being “Ultimate Otaku Teacher,” many of the events involve aspects from that type of lifestyle. More specifically, the anime uses these aspects to solve the various problems the narrative introduces. A character has difficulty making friends, so Junichiro has him play a video game to improve his soccer skills. Another character needs good grades in physics, so Junichiro makes a training game from scratch to help her practice. Yet another refuses to accept his true identity, so he has the rest of the class hang out with him in an MMORPG to improve his confidence. Lots of video games, but the show also uses television cartoons, manga, and maid cafes as other solutions to the difficulties at hand. Doing so demonstrated that, at the minimum, the anime understood that using one of its central motifs was not just mandatory but also vital. Vitals at this point fail, the remainder of Denpa Kyoushi an atrocious mess of miraculous proportions. The biggest flaw is the show’s inability to use previous events to drive the plot forward. When one arc concludes, the anime seemingly forgets about what happened. Characters make cameos without purpose, the outcomes have little impact, and all the while the show continues to inject more of both. For example, one plotline involves a teenage girl who does not want to be married off to a rival of her parent’s company. After Junichiro helps her out, though, she (and the guy) disappear for the last ten episodes or so, as if her predicament never happened or, worse, did not matter. Denpa Kyoushi does this constantly mostly because, again, the show never stops bringing in people that needed saving. The first half consists of roughly seven students and the second half consists of roughly the same number, each of who are different from one another. The result is the show jumping from student to student, no connection between the individual plotlines found. For each student, the narrative takes the same approach: articulate their plight, reveal the relevant bits of their past, and eventually get them to learn their lesson. This setup has a nice past, present, and future construction, but save for a couple of instances, the anime refuses to deviate from this formula, quickly devolving into a repetitive pattern. Their pasts are considerably important because they are what created their internal conflict – a mean video surfaced, a feeling of guilt, and so on. Despite the trauma the characters faced, the majority of the flashbacks are only briefly shown, glimpses rather than occurrences. In other words, their personal problems lack the emphasis required to make them worthy of investigation. Many of the backstories are also isolated, pertaining only to the character or characters investigated rather than having relevancy to the other students involved, perpetuating the disconnectedness the anime continually touts. The finale likewise does not escape from stupidity. The characters put themselves into their original holes precisely because they had no one else to turn to. So when Junichiro gives them total control, his decision counterintuitively goes against the anime’s own motif on seeking outside help. His final decision to essentially eliminate the need for teaching in favor of self-teaching also goes against its teacher motif; a gross mistake. The finale also makes it glaringly obvious how underused the characters were throughout the season: the show halfheartedly has about half of those that Junichiro helped (not everyone, just half) show up to cheer him on. They were not present when he needed them most – despite doing just that for them – so their presence at the end is more a slap to the face than it is a sincere goodbye. More issues exist besides the jarring plot, the misused flashbacks, and the horrid finale. One, the comedy. Junichiro’s younger sister berating him, him getting mad about people misunderstanding his interests, and the mistimed jokes make the show a slog to endure. Two, the romance. Many of the girls, upon having their problems corrected, fall for the teacher, but these feelings are never explored. In fact, the girls’ feelings either come out of nowhere or are brought up only to never be mentioned again – usually caused by the show refusing to either include the girl rarely (or never) afterwards. Even disregarding all of these problems, the worst part is that Denpa Kyoushi does not even try to be anything. There is no real overarching plot, no unified theme ties everything together (despite there being numerous motifs), and there is no purpose behind the various events that take place. The anime is a slow burn of nothingness that – rather appropriately – ultimately leads nowhere. Denpa Kyoushi has some of the worst art and animation in the medium, the latter barely existing in the first place. Aptly speaking, the anime is ugly. When it comes to actual animation, the show is severely below average. This is not an understatement: still frames litter the show, usually just the characters mouths seeing any kind of movement. The anime reaches its lowest point animation-wise very early on, in episode six where the soccer match becomes what might as well have been a bunch of cardboard cutouts kicking a circle around. Another vivid example is in episode thirteen, Junichiro typing away on his keyboard, but not so much typing as he is flexing his fingers while sweeping his hands across the keys. In the general sense, Denpa Kyoushi barely moves its characters, even during action-heavy scenes. Eyes rarely blink, hair hardly ruffles, and clothes seldom contort, placing the show in a negative light of its own doing throughout the majority of the season. Art follows the actual animation’s footsteps (more specifically, the actual animation’s dragged path). Again, this is not an understatement: the show has problems at even the most basic of levels. Lines are jagged, civilians amorphous blobs rather than humans. Colors are overly vibrant, blinding the audience rather than inviting them to watch. Backgrounds are bland, environments drawn from memory rather than living places. All of this speaks nothing of Denpa Kyoushi’s lack of shadowing, subpar camera direction, and unsettling CG work. The show is an eyesore, a nonstop travesty that bruises the brain. Equally awful are the character designs which are, mildly put, disgusting. Each person seems as if they forgot to use conditioner when taking a shower, their wiry and wonky hair nauseating the audience. Once again, everyone has an overt brightness to their design. Not that light strikes them in a godlike manner, but instead the colors that make up their clothes and hair is unnecessarily saturated. Many of the characters also have abnormally large foreheads. The ones that do not are usually the ones that wear their wiry, unconditioned hair down to cover their defect. 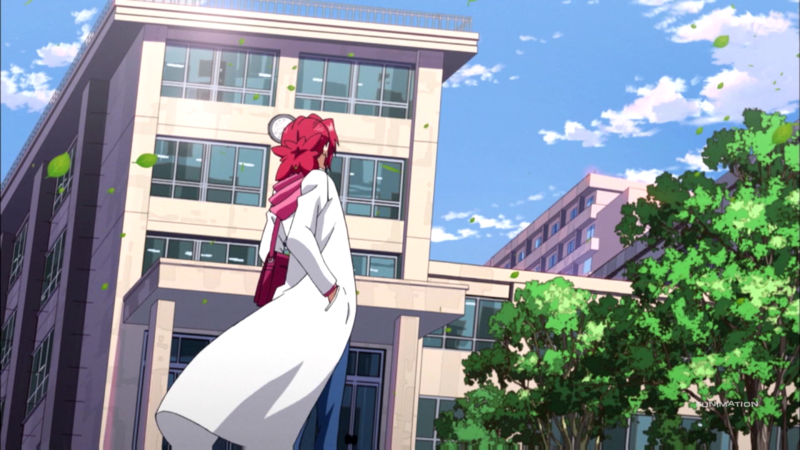 Looking in-depth at their actual construction, Junichiro’s lab coat and glasses paint him as both a smart guy and a teacher, his red hair matching his random yet wholehearted passion. Nanami’s spiky hair and slanting eyes turn him into the rough dude he tends to be. Sachiko’s long blonde hair and more formal attire makes her more mature than the rest of the characters despite her small stature. This same inspection can be applied to the entire cast, but given their inherent unsavoriness, doing so too many times would adversely affect one’s health. 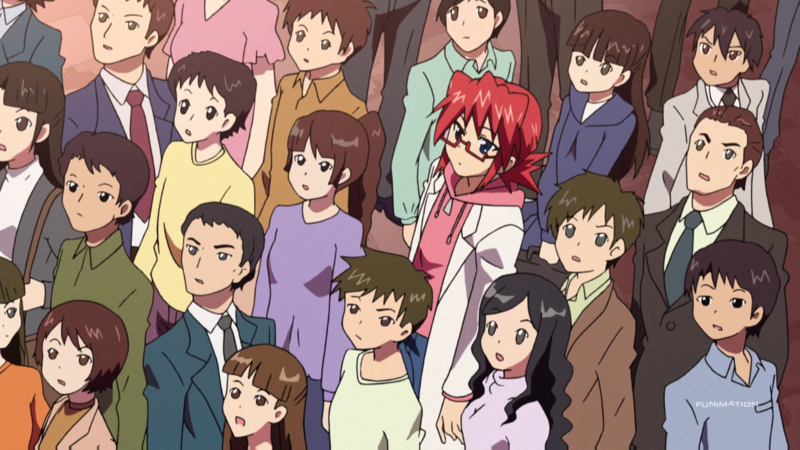 Realistically, the cast of Denpa Kyoushi is large, with well over twenty people taking the limelight over the course of the season. Comparatively speaking, the characters are the best feature of the anime, though that is not saying a whole lot. Early on the anime seems, at the minimum, poised to have an adequate cast. 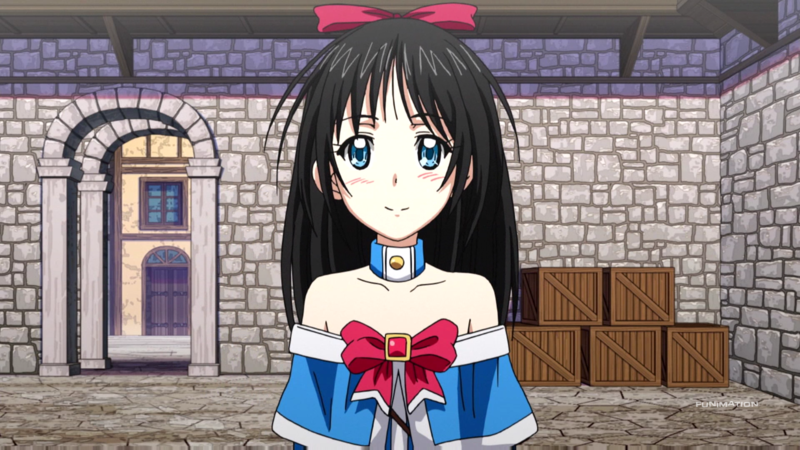 Minako is the first character developed. Her past life as a street kid affected her transition into a “normal” teenage life, her old friends bullying her in her current lifestyle. As was mentioned previously, this is how the anime approaches every character: some flaw in the character’s past is revealed, said flaw’s effects on this character’s present are showcased, and, upon Junichiro helping out the student, their future is saved. 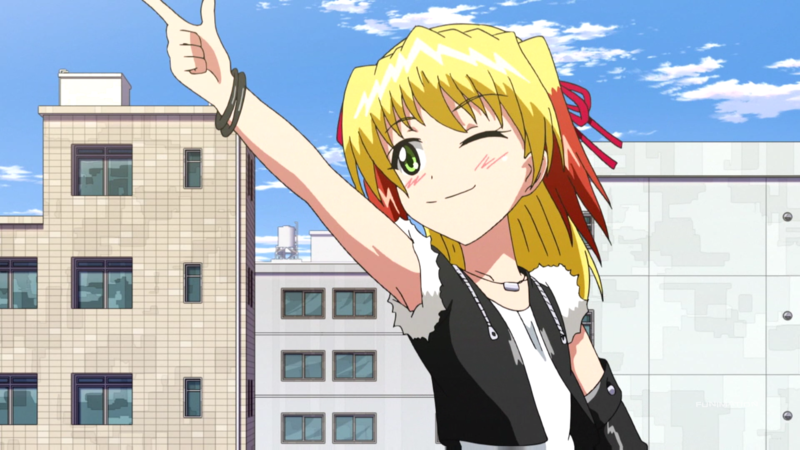 Minako is the same, the anime focusing on this singular form of development for each of its characters. Kiriko, Nanami, Shachiko, Kanan, and Koutarou as well follow this same path. The growth is repetitive and nothing major, but the anime at least has complete stories for each of its characters. Besides Koutarou, one of the major problems with this setup is how little actual time is spent on the characters. The size of the cast forces the people involved to have regularly one or two episodes maximum for expounding on their individual tales. Combined with the aforementioned, constant ditching of its characters following their arcs, the characters ultimately feel unfulfilling. Koutarou is exempt from this issue since the anime, rather surprisingly, takes its time describing his situation and his overall journey. His hobby – dressing up as a girl despite being a boy – caused a lot of hate to funnel his way. Therefore, he secluded himself, away from people to continue his desires while avoiding any further ridicule. The only place he found that fully accepted him was an online video game, his character’s looks reflecting his own style. When Junichiro learns of Koutarou’s self-seclusion and personal struggles with identity, he forces the boy to confront his past aggressors. In the end, Koutarou comes to accept himself – girl and all – providing the audience with the message that one should never be afraid to be who they really are. Koutarou is the best character of the anime and, while he, too, hardly has a presence following his own arc, saves the cast from being fully badly written. Giving credit once more, Denpa Kyoushi does switch up its approach when the second half rolls around. The show decides to tackle couplings: a rich girl and an arrogant guy, twin sisters, and Junichiro himself with an ignorant child. The anime still leans on its initial direction at times – a ghost girl wanting to draw and a little kid understanding that some mistakes need to be corrected with one’s own power. However this new, dual-aiding becomes the norm. As expected, this makes the characters even more unfulfilling, since the time spent on the new set of people is divided in two. Many of these plotlines are lacking thematic strength as well – the talks about arrogance and amusement are barely explored (relative to the first half’s themes). Only the twins’ arc, focusing on “one’s place” and familial bonds through their mirroring careers, their sisterly status, and their affinity for a cartoon based on family, has any merit. Plus, similar to Koutarou’s arc, the anime takes a bit more time than usual to craft the events and its characters in the twins’ arc, giving the second half a much needed boost. Mentioned in passing was that Junichiro himself has an arc of his own, where the anime attempts to make Junichiro the one in need of saving. Technically he shares the arc with another character, but the purpose of the final few episodes is to have the star undergo development of his own. Junichiro’s whole idea centers on his signature attitude: what he “yearns to do” more than anything. Ironically, the time he spent saving the various kids leads him into thinking that his teacher job is not what he really wants to do. Already this spells doom for the anime; spending nearly the entirety of the season on his helping exploits only to turn around and say that what he was doing was wrong (for him) all along is nothing short of nonsensical. Still, he believes this, deciding to work on one of his previous theories: the “Anywhere Door”. Once again, though, a problem arises. Notably is the door itself. Passing references to the door are made in the beginning and in the middle, but not until the end does the door have any sort of significance. Meaning the anime using the door as a way to expound on Junichiro has very little foundation to work with. Furthermore, the anime tries to use the “Anywhere Door” as a symbol for Junichiro’s own passion. The final few events has the anime showing that since he does not want to make the door, one can conclude that Junichiro has already found what he wants to do. The conclusion? That he wants to help out the kids by letting them help themselves. That is to say, he returns to what he had been doing for the whole series, making his detour a faux attempt at developing his character. In short, Junichiro’s arc has no execution whatsoever which, given the rest of the anime, is an appropriate way to finish the season. The first opening theme is a huge mess, the pounding beat and the constantly changing vocalists grating on the ears. The middle of the piece changes into one that is floatier in nature, which has no place within the mood of the anime. When the singers work together, the track has a bit more harmony, but that only happens sparingly in the second half of the piece. The piece ends in an abrupt manner, though, killing any sort of praising it might have earned. The second OP is somewhat stronger, the lyrical composition easier to listen to than the first OP. The tone of the piece, however, is still very much a “single” sound, the instruments and beat blending together to make a piece that is more noise than a coherent song. This time the track ends in an appropriate manner (lots of “la”), so comparatively much is gained between the first and second OP. The first ending theme is a childish song. The cheery tune, the vocalists, and the instruments are all designed to make the piece kiddy in design, fitting the childish vibe of the actual anime. The track is catchy, meaning there is some merit to its effectiveness. Regardless, the piece is neither grand in scope nor grandeur in sound, making it a tough sell to listen to outside of the show itself. As for the second ED, it follows the footsteps of the second OP, mashing together a repetitive beat with a set of instruments that makes the song hard to listen to for any length of time. The “hey, hey, hey” and the stuttering lyrics try to soften the blows that the piece assails the listener with, but similar to the first OP, the track ends pretty abruptly, once again ruining any sort of traction it made have garnered. Perhaps obviously at this point, the remainder of the soundtrack is filled with pieces that have next to no worth. Tense piano tracks, slice-of-life violin tracks, and poignant flute-filled ones. A distinct, western-cowboy track exists for those buddy-buddy moments as does a resounding, triumphant tune when Junichiro succeeds. Collectively, the OST offers very little of value even if the pieces themselves fit their respective occasions, reducing the overall execution of the anime that much more. And just for good (bad) measure, the voice acting in the anime is below average. Hiroshi Kamiya provides a competent performance, his geeky voice a decent fit for the adult, male teacher. Suzuko Mimori provides an average performance as well, her mature voice fitting the character’s position but not necessarily the character’s person. However and sadly, Rena Matsui, in her first role ever in the medium, gives one of the worst performances in recent years. Her emotions, way of speaking, and inflections simply do not work, making each of her appearances on-screen a battle to sit through. Unfortunately her performance brings the whole VA package down a few notches. This anime at least did something that no other anime I have seen has been able to do before: be beyond lame. Junichiro’s signature catch-phrase, “Time to start the lecture,” followed by him snapping his fingers, has got to be one of the lamest actions I have seen in anime. Lame to the point that I was actually mocking him, saying his line in a stupid voice and performing the same gesture. And since he did this constantly, I for a time became the “YD” dude. I could never take him seriously which, by extension, made it difficult for me to take the anime seriously. “YD” is another part of Junichiro’s personality that was lame. Listening to the beginning, with the “yukata de date” and the “yakiniku daisuki”, followed by mentions of his “yearn to do” lifestyle, irked me nonstop. This guy, if he wanted, could: cure cancer, solve world hunger, invent never-before-seen technology, eliminate economic disasters, and ensure global peace if he wanted to. But simply because he did not feel like it, all of humanity must suffer. Is it fair to expect this of him? Should someone with the capabilities to positively affect life never use said capabilities? This brings up questions of free will and personal choice, but I think asking to correct one of these prevalent problems when it is so easy for him is not too much of a request. Did I have fun watching this one? I am not sure, to be honest. Part of the reason I got into this one to begin with was because of the “romance” tag it touted. Having gone through the whole season, said “romance” was a sham. As was stated, the comedy is horribly executed, so laughs were a rarity. Outside of a small reaction to the ghost girl’s story, none of the drama instilled an emotional response from my soul. Junichiro got on my nerves like none other, but many of the other characters were no different. Sachiko’s “blood boiling” line was not funny, Nanami’s personality was too abrasive, and Tim was such an unneeded character. I think the only aspect of the anime I could truthfully say I liked were the nicknames – “Options,” “Cyborg,” “Potato”, and so on. They were clever given each character’s context, but they also symbolized the close relationship Junichiro had established with the people around him. Still, nicknames alone cannot save an entire, two-cour show. As a last remark, I have a theory why this anime was unbelievably awful in nearly everything it did. Despite the show having subpar voice acting, some of the most popular and recognizable voice actors and actresses were enlisted. Huge names such as Hiroshi Kamiya, Yoshitsugu Matsuoka, Kana Hanazawa, Risa Taneda, and a few others. The last three are significant since they are barely present. Yoshitsugu Matsuoka has such an infinitesimally small role compared to everyone else in the cast that it almost makes no logical sense why the show decided to invite him in the first place. Thus, the conspiracy is born: the anime spent so much time and resources on hiring A-List voice actors and actresses that there was no money left to spend on directing, animating, and producing. The diverting of resources to these bigger talents also lends credit as to why Rena Matsui was given the main role as the sister; the anime did not have the money left to acquire a bigwig, thus they gave a main lead to a complete newcomer. Is my theory true? I like to think it is. Otherwise there is nothing to justify the abysmal turn this show took from the very beginning. Denpa Kyoushi is impossibly atrocious. The story is ridiculous, the art is vomit-inducing, the characters are annoying, the sound is ear-bleeding, and the enjoyment is nonexistent. Suffice it to say that it is not a mystery why this anime deserves no better place than the dumpster. I’m not going to spend any more energy on this than necessary. I remember the manga being fine, but after seeing this mess I’m starting to doubt my own judgement. One of the very few 1/10 anime I’ve seen until the end. Even the voice acting sucked. Quite possibly the only role I’ve heard HIroshi Kamiya perform in which he disapointed me, and everything that guy touches turns into freaking gold. I imagined Kagami with Daisuke Ono’s voice (I think that was even the original plan before the show aired), so that was already really strange. And with all due respect to voice actors as a whole but I think Suzune’s VA has to rethink her career choices. > I’m not going to spend any more energy on this than necessary. I could possibly see him in the role, if only because he can and has multiple voices to give for different characters. > And with all due respect to voice actors as a whole but I think Suzune’s VA has to rethink her career choices. I feel bad for her. 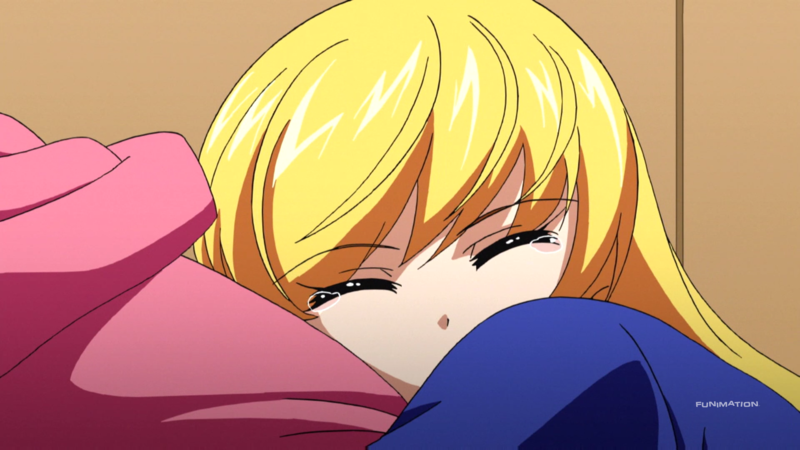 It was her first ever role in anime but it was so terrible that I am not sure if she will be given a second chance. She deserves it — everyone does — so hopefully her next venture will be more representative of her talents.